Tag line: "The Deadliest Enemy the World has ever Known!" So which is it? Did the alien in Edgar Ulmer’s 1951 Sci-Fi extravaganza, The Man from Planet X, land on earth to scope it out for a planned invasion, or did mankind piss off an otherwise benevolent visitor, and in so doing seal their own doom? I just got done watching the film, and I’m not really sure myself. American journalist John Lawrence (Robert Clarke) travels to Scotland to visit the observatory of astronomer John Elliot (Raymond Bond), who is monitoring a runaway planet, which he calls “Planet X”, that’s on a course to pass by earth within a few days time. Yet even more remarkable than the mysterious Planet X is the discovery of a spaceship resting in the moors, one composed of a new metal alloy stronger than steel, and at only a fraction of its weight. The ship’s pilot is a lone alien being who's brought back to Elliot’s laboratory so he and Lawrence can try communicating with him. But any chance of a friendly give-and-take is lost when Elliot’s assistant, Dr. Mears (William Schallert), attempts to force the alien into revealing the secret of his ship’s metallic compound, which Mears then plans to sell for a small fortune. Angered by this, the alien first kidnaps Elliot’s daughter, Enid (Margaret Field), then prepares for a full-scale invasion of earth by his people, who will arrive the moment Planet X moves within range. With little time and few options available to him, Lawrence tries to convince the authorities our planet is in the gravest danger, and if they don’t take action soon, it may spell the end for all of us. We’re clued in that Dr. Mears is of a somewhat dubious nature when John Lawrence first arrives in Scotland. None too happy to see him, Lawrence scowls a bit when introduced to Mears (we’re never quite sure what it is about the good doctor that has Lawrence so upset, but he hints Mears might have a criminal past when he tells Enid “He should have gotten 20 years” for whatever it was he did). But any questions we may have regarding Mears' professional ethics are answered the moment he’s left alone with the alien visitor. In the film’s most powerful scene, Mears resorts to violence, knocking the creature unconscious in order to dismantle his suit, hoping it will provide clues as to the nature of the new metal compound. Schallert is strong as the shifty Mears, a man whose lust for the almighty dollar might have kicked off the end of civilization as we know it. 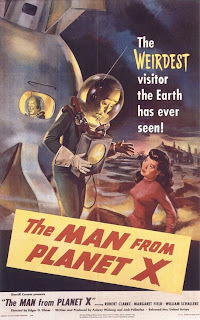 Functioning as an effective human parable on the dangers of greed, The Man from Planet X also helped usher in the age of hostile alien films (pre-dating War of the Worlds and Invaders from Mars by a couple of years, and released one month before The Thing from Another World). Full of atmosphere (the fog-filled Scottish moors prove the perfect location for hiding a spaceship) and mystery, The Man from Planet X is an early sci-fi adventure fans of the genre are sure to enjoy.